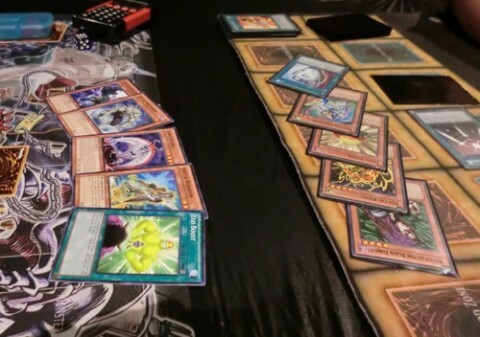 If you read the coverage of the Dragon Duel WCQ yesterday, you probably saw Marissa Chow pulling off some awesome moves with her Dragunity Chaos Dragon Deck in our Round 2 Feature! Today, her father is undefeated in the Sealed Pack Ultimate Challenge: Patrick Chow has been Dueling for over a decade, and today he opened an amazing Sealed pool including Harpie’s Feather Duster, Call of the Haunted, double Premature Burial and more! 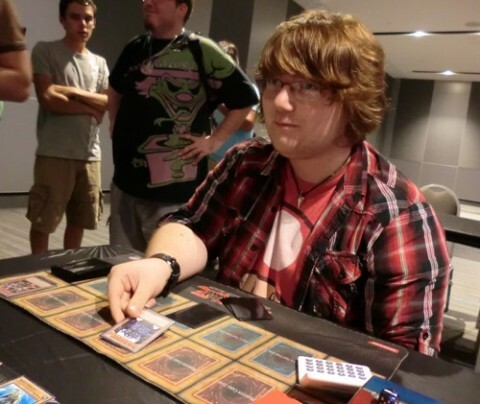 His opponent is Danny Tripodi, a Syracuse Duelist who’s 2-1 so far with a Deck that can Summon Obelisk the Tormentor. This could be a good one! Chow started us off with a hand of Zombyra the Dark; Dark Ruler Ha Des; Wind-Up Soldier; Vampire Lord; and not one, but two copies of Premature Burial! He Summoned Zombyra. Tripodi Set a monster, then set a whopping three cards to his back row! Chow drew Gogogo Golem, and Summoned Wind-Up Soldier. He activated its effect, boosting it to Level 5 and 2200 ATK until the End Phase, and attacked with Zombyra: it collided with Tripodi’s Set Grave Squirmer, and when Squirmer was destroyed, Tripodi used its effect to destroy Wind-Up Soldier. Zombyra dropped to 1900 ATK. Tripodi Summoned Voltic Kong and used Skill Successor to boost it by 400 ATK. Voltic Kong went to 2200 ATK, and attacked over Zombyra to destroy it, sending Blast With Chain from the top of Chow’s Deck to the Graveyard. Chow drew Witch of the Black Forest. He Summoned Gogogo Golem and attacked Voltic Kong, but Tripodi denied the kamikaze attack with Shadow Spell. In Main Phase 2, Chow activated Premature Burial to Special Summon back Zombyra, and stacked it with the Golem for Number 39: Utopia. Tripodi destroyed it with Offerings to the Doomed! Tripodi didn’t draw for his turn, but he Summoned Dark Valkyria, making direct attacks with Kong and Valkyria. Chow lost Slate Warrior off the top of his Deck. Chow drew Interdimensional Matter Transporter, and used his second Premature Burial to bring back Gogogo Golem. He Summoned Witch of the Black Forest; stacked both monsters; and Xyz Summoned Gem-Knight Pearl. Chow attacked over Dark Valkyria to destroy it, and Set Matter Transporter. Tripodi Summoned Toon Gemini Elf and activated Skill Successor’s effect, banishing it from his Graveyard to boost Voltic Kong’s ATK to 2600. Kong attacked to trade off in battle with Gem-Knight Pearl. Chow drew and Set Shield Warrior. Tripodi attacked with Toon Gemini Elf, destroying Shield Warrior, and Set a monster. Chow drew and Set Ryko, Lightsworn Hunter. Tripodi attacked Ryko with Toon Gemini Elf: Chow banished Shield Warrior to keep Ryko from being destroyed, and used Ryko’s effect to blow away Tripodi’s Set Ego Boost. Chow sent Forbidden Lance, D.D. Assailant, and Grave Squirmer to the Graveyard, and Tripodi Set a monster. Chow drew Fabled Raven, and Tributed Ryko to Summon Dark Ruler Ha Des, attacking into Tripodi’s Big Shield Gardna! Gardna survived! Tripodi Summoned Doomcaliber Knight, and stacked it with Big Shield Gardna to Xyz Summon Number 39: Utopia. Utopia attacked over Ha Des to destroy it, and Toon Gemini Elf attacked to force Chow to discard Fabled Raven! Chow drew Gorz the Emissary of Darkness. The Duel stood at 400 Life Points, to Tripodi’s 7200, so that Gorz wasn’t very helpful. Chow considered a moment, looking at his hand of Gorz and Vampire Lord, and quickly conceded. Skill Successor lets Danny Tripodi fight through a rough early game, and he slowly builds momentum to take the first Duel! One more win like that, and he’d have a strong shot at the Top 8. Chow started the second Duel with a hand of Fabled Raven; Half or Nothing; Fortress Warrior; Creature Swap; Goblindbergh; and D.D. Assailant. He Set Fortress Warrior and Half or Nothing. Tripodi Summoned Vortex Trooper, returning two cards from his hand to his Deck to draw two more. He Set a card to his back row and ended. Chow drew Slate Warrior and Summoned Fabled Raven. Raven attacked, and Tripodi pitched Arcana Force XIV – Temperance to prevent himself from taking damage. He drew a card for Trooper. Tripodi Summoned Botanical Lion, and attacked Fabled Raven: Chow tried to block with Half or Nothing, but Tripodi Chained Ego Boost! The Lion went to 2900 ATK, and was then halved to 1450 ATK, destroying Fabled Raven. Chow drew Premature Burial. He Summoned Goblindbergh; Special Summoned Slate Warrior; and Xyz Summoned Gem-Knight Pearl. The Gem-Knight attacked over Botanical Lion, destroying it, and Chow ended. Chow drew Gogogo Golem and Summoned it. Gem-Knight Pearl attacked Tripodi’s Set Tanngrisnir of the Nordic Beasts, destroying it, and Tanngrisnir’s effect triggered to Special Summoned two Nordic Beast Tokens. Gogogo Golem destroyed a Token in battle. Tripodi Summoned Doomcaliber Knight and attacked to destroy Gogogo Golem. Chow drew and Summoned Witch of the Black Forest, and attacked over Doomcaliber with Gem-Knight Pearl. The Witch attacked the final Nordic Beast Token. Tripodi activated Fiend’s Sanctuary, Special Summoning a Metal Fiend Token. He Summoned Cyber Valley, but didn’t use the Valley’s effect to remove his Token and draw two cards, opting to leave Valley on the field instead. 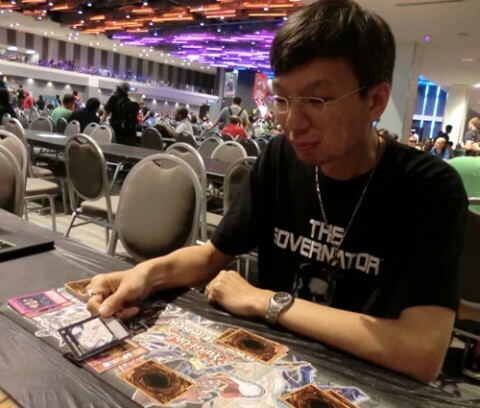 Chow drew Ryko, Lightsworn Hunter and attacked the Metal Fiend Token with Witch: Chow took 1100 Battle Damage, then moved to Main Phase 2 to Set a monster. Tripodi Set a monster, then Set a Spell or Trap. Chow drew another Premature Burial! He Flip Summoned Ryko, targeting Tripodi’s Set Spell or Trap… Needle Ceiling! Ceiling wiped the field of face-up monsters, and Ryko sent three cards from the top of Chow’s Deck: Ego Boost; Card Guard; and Grave Squirmer. Witch of the Black Forest’s effect let Chow search his Deck for Vampire Lord, and he Tributed his Set Fortress Warrior to Summon it. Vampire Lord attacked, hitting Tripodi’s Dekoichi the Battlechanted Locomotive and letting him draw a card. Chow drew Shield Warrior. He attacked, destroying Grave Squirmer, and Squirmer destroyed Vampire Lord. The Vampire would Special Summon itself back in Chow’s next Standby Phase: he Set Shield Warrior in the mean time. Tripodi Summoned Twin-Headed Behemoth, attacking into Shield Warrior to flip it. Chow drew Change of Heart! He Special Summoned Vampire Lord; Normal Summoned D.D. Assailant; and attacked with Vampire Lord to destroy Behemoth. Vampire Lord’s effect triggered, sending Big Bang Shot from Tripodi’s Deck to his Graveyard. Assailant made a direct attack, lowering Tripodi to 4300 Life Points, and Chow ended. Twin-Headed Behemoth returned to the field. Tripodi Tributed Behemoth to Summon Zaborg the Thunder Monarch, destroying Assailant with Zaborg’s effect. Zaborg then ran over Vampire Lord in battle. Chow drew Makyura the Destructor. He turned Shield Warrior to Attack Position, and traded it for Zaborg with Creature Swap. Premature Burial let him Special Summon back Gem-Knight Pearl, and Chow Normal Summoned Makyura. Pearl, Zaborg, and Makyura all made attacks to finish the Duel. Patrick Chow takes a decisive win in the second Duel, not even deigning to use a number of his most powerful in-hand cards to secure victory! Tripodi started the final Duel by Setting a monster, and Setting a Spell or Trap Card. Chow had Axe of Despair; Morphing Jar; Insect Knight; Interdimensional Matter Transporter; Call of the Haunted; and Premature Burial. He Summoned Insect Knight and attacked, destroying Tanngrisnir of the Nordic Beasts: Tripodi Special Summoned two Nordic Beast Tokens, and Chow Set Matter Transporter and Call to finish the turn. Chow drew Level Eater, and attacked Tripodi’s Twin-Headed Behemoth with Insect Knight. Chow Set a monster, and Behemoth returned to the field! Tripodi Tributed all three of his monsters to Summon Obelisk the Tormentor! Tripodi attacked Insect Knight with Obelisk, and Chow banished the Knight with Matter Transporter to save it. Obelisk went after Chow’s Level Eater instead, destroying it, and when Tripodi ended the turn Insect Knight returned to the field. Chow drew and activated Swords of Revealing Light! He Set a monster, and Set another Spell or Trap. Tripodi Set a monster, unable to get through Swords. Chow drew Fiendish Chain and Set it, then Set his last card, Axe of Despair. He Flip Summoned Morphing Jar! Chow drew Doomcaliber Knight; Gorz the Emissary of Darkness; Half or Nothing; Chiron the Mage; and Dark Ruler Ha Des: still no outs to Obelisk. Just a couple minutes remained in the Match. Chow Summoned Chiron and stacked it with Insect Knight, making Number 39: Utopia. Utopia then attacked into Big Shield Gardna, taking 100 Battle Damage! The Duel stood at 7900 Life Points to 8000. That 100 damage might make all the difference here, as we were headed into time. Or not! Tripodi drew Harpie’s Feather Duster! It destroyed all five of Chow’s Set cards, and Tripodi followed up with Fiend’s Sanctuary! He Tributed his two monsters to clear the field with Obelisk’s destruction effect, then Set another card to his back row! Obelisk couldn’t attack this turn, so Tripodi ended. Chow drew Fabled Raven and passed. Tripodi Summoned Goblin Attack Force, and time was called. Five turns would be conducted after this one. Tripodi boosted Goblin Attack Force with Skill Successor, then Big Bang Shot, taking it to 3100 ATK. Goblin Attack Force attacked, and Tripodi boosted it to 4100 ATK with Ego Boost… But Chow Special Sumoned Gorz the Emissary of Darkness and its 4100 ATK/DEF Emissary of Darkness Token in Defense Position! Obelisk smashed Gorz, but Chow was still alive! Tripodi activated Swords of Revealing Light. Chow drew Cyber Jar! Setting it would be a big risk, but the Match was in time and he had to set the Jar regardless. Chow also Set Half or Nothing. Tripodi attacked Cyber Jar with Obelisk, losing his Goblins and his God Card! Tripodi flipped the top five cards off his deck: Pot of Duality; Vortex Trooper; Level Eater; Voltic Kong; and Witch of the Black Forest. He Set everything but Witch. Chow flipped Gogogo Golem; Grave Squirmer; Card Guard; Shield Warrior; and Ego Boost. He Set Squirmer and Shield Warrior, and brought out Gogogo Golem and Card Guard in face-up Attack Position. Tripodi flipped Needle Ceiling, destroying Card Guard and the Golem, as well as his own Witch, getting Zaborg the Thunder Monarch from his Deck! He Set another Spell or Trap. Chow moved into Turn 3 of the Match time countdown. He’d have one turn after this one to try and even the score, but for now he was still locked down under Swords of Revealing Light. He Summoned Doomcaliber Knight and ended. Tripodi Summoned a Doomcaliber of his own. Chow drew Slate Warrior, holding Fabled Raven, Ha Des, and Goblindbergh: he was finally free of Swords! But he was facing Doomcaliber Knight, three Set monsters, and a Set Spell or Trap Card, and the Duel stood at 3800 Life Points to 8000. Chow was down by 4200. He Tributed Shield Warrior to Summon Ha Des; attacked to smash Doomcaliber Knight; and activated Ego Boost. Tripodi negated it with Spell Shield Type-8, and the resulting damage was nowhere near enough to even the Life Point score. Chow offered the handshake!